The Book Lovers, which opens at New York’s EFA Project Space in the Chelsea area of Manhattan this week, takes the form of an exhibition, series of events and a library about the phenomenon of the artist’s novel. The curators, David Maroto and Joanna Zielińska, say that their intention is to ‘create public awareness’ about this subject. Visibility is an important issue as although they can be widely circulated and have a much farther reach than an exhibition - engagement with books is often a solitary experience- the reader, the book. The exhibition features the work of Tim Etchells, Tom Gidley, Jill Magid, Roee Rosen, Lindsay Seers, Goldin+Senneby, Alexandre Singh, and Julia Weist. Most of the artists use text or language in their work. 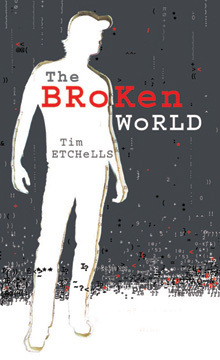 Etchell’s, for example, who published his first novel, The Broken World, in 2008 is known for his text based works, often in lights and in public space. Magid produced the fascinating diaristic survellence style One Cycle of Memory in the City of L during her time in Liverpool, preparing for the 2006 Liverpool Biennial. Several events are programmed including a presentation by Roee Rosen on the work of Jewish Belgian Surrealist artists and pornographer Justine Frank and a public reading performance based on Keren Cytter's novel The Seven Most Exciting Hours of Mr. Trier's Life in Twenty-four Chapters. The novel will be read aloud by actors, each of the twenty-four chapters of the novel read on the relevant hour. The artist duo, Goldin+Senneby will both screen and perform their novel, Looking for Headless. A library collection of novels written by artists is also available to visitors. Featuring writing from over 140 artists including Carl Andre, Keren Cytter, Salvador Dalí, Tim Etchells, Liam Gillick, Pablo Helguera, Stewart Home, Joseph Kosuth, Yayoi Kusama, Jana Leo, Mai-Thu Perret, Tom McCarthy, Richard Prince, Andy Warhol. This resource had previously been on view at M HKA (Museum of Contemporary Art in Antwerp, Belgium) and has been acquired by the museum for its collection so will return there permanently. Recent writing is accompanied by older works, for example Salvador Dali’s 1973 Hidden Faces which follows the lives of a group of eccentric 1930’s aristocrats. Also present is Yayoi Kusama who has written several faux-autobiographies including Manhattan Suicide Addict, an account of the years she spend in New York in the 50’s and 60’s. The Book Lovers – A project about Artists Novels opens on Wednesday and runs until March 9th 2013. The Moonshiner is a new print and multimedia project by Peter Hoffmeister and Jack Laughner that begins with a newspaper functioning in concept as a critique of corporate mass media. The first issue is loosely based around the experiences of Malcolm Vernon Ford, a fictional character supposed to represent a typical everyday citizen, and explores theories of a rising police state in the U.S and raises issues of surveillance in contemporary American life. Instead of featuring written articles, the newspaper is primarily visual. Almost like a series of prints, the function of the newspaper medium is changed – both another printed daily throwaway like the Metro and a covetable art object. You simultaneously want to file it and chuck it. This is also a statement by the artists into the relevance of the print medium, not so easily deletable or clock-away able as digital media. 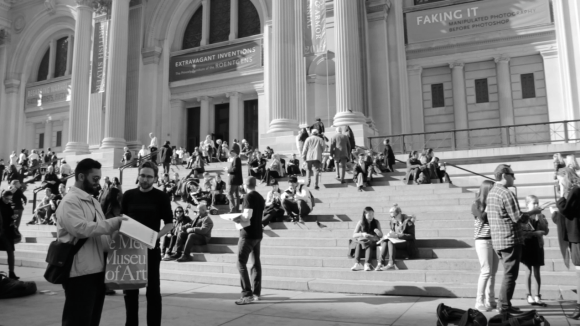 Hoffmeister and Laughner distribute The Moonshiner outside New York City art museums, making the process of circulation both a performance and a protest against corporate mass media and issues of corruption at governmental level. 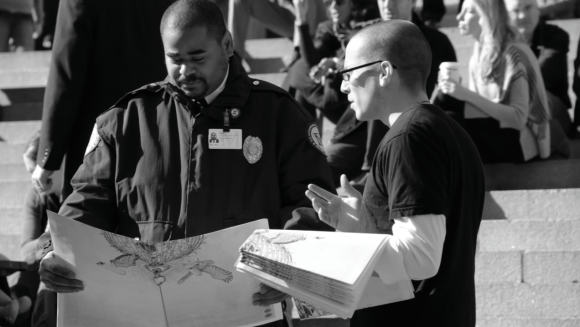 The duo have set up a website functioning as context for the project especially in light of emerging events, for example the recent Newtown mass shooting. They are also using the popular and useful fundraising site Kickstarter to raise cash to fund future Moonshiner issues. The campaign has some great sweeteners to your donation, including original prints by Hoffmeister, paintings by the fictional Malcolm Vernon Jones and also if you pledge the highest amount of $500 they will come to your house or office and paint a wall-sized mural!